It sounds like the development system operates like a 12.1 inch monitor you can plug in like a second display, except it supports all the DuoSense features. I sent N-Trig a message asking about the availability and price of the development system. This is pretty critical to getting good applications developed for systems that don't even exist yet. In addition, many of the multitouch systems out there are not that powerful, CPU-wise. The Dell Latitude XT2 maxes out with a 1.4 ghz processor, not something I'd want to be stuck on for a development system. The N-Trig DuoSense supports true multitouch (more than just two-touch) plus stylus as well, so it is pretty popular. It is getting to be a standard choice for multitouch digitizers. It is used in the Dell Latitude XT and XT2 plus the HP TouchSmart tx2. The developer community around each of these tablets is quick to provide feedback to N-Trig and waits for each new release of the Windows 7 beta drivers. N-trig, providers of DuoSenseTM technology, combining pen and capacitive touch in a single device, are further advancing the multi-touch adoption process with the new DuoSense Development System. This device enables software developers to create touch-enabled applications on their own computer. The DuoSense Development System is an extension touch-enabled display that provides a powerful and simple development environment for programmers, shortening the development life-cycle and reducing costs. The system connects to any PC via a USB and enables ISVs to develop multi-touch applications while simultaneously viewing the results of their work on their computer screen. As more OEMs are looking to incorporate multi-touch into their R&D roadmaps and the availability of Windows 7 becomes a reality, the evolution must start with the software developers. N-trig has designed this unique system to bridge the gaps that currently exist between ISVs and multi-touch enabled programs. Going forward, no longer does multi-touch development require a pen and multi-touch enabled computer. 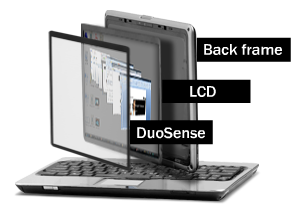 The DuoSense development system boasts a 12.1 inch screen and can be connected to any computer. After loading the latest software versions, which can be found at http://www.n-trig.com/Content.aspx?Page=Multi_Touch, developers are all set to go multi-touch. Richard Wand posted a summary of the PR nightmare for the Microsoft Surface team last week. This whole thing really was unfortunate because I know the Surface team has gone to great lengths to make sure the user experience with Surface is top-notch. The experience this one company had was basically the result of a few people not thinking things through and then posting on their blog a comical version of their experience. Unfortunately, the comedy part of it is lost when fanboys of various flavors looking to repeat and magnify any criticism of Microsoft. Fortunately, the Surface Team (and other people with brains) responded to the criticism immediately and made things right. Well, there wasn't much they could do since the problem was mostly those people not knowing what they were doing initially, but they at least made contact with them to discuss their feedback. This whole event highlights the importance of user experience (particularly when you are positioning yourself as a premium UX) and also about the responsiveness of marketing teams. Bad news can spread in a matter of hours beyond your control, so if you do not participate in the online conversation, you won't know what people are saying about you and won't have a chance to set things right. (Of course, you have no hope of controlling what people say, but at least you can inject your version of things.) The easiest way to prevent this, though, is to have a top-notch UX. I think Surface does have a great experience, not only in software but the device installation teams and developer training. This one company just tripped over itself and fell through the crack. I wonder that little marketing firm would have written about trying to setup Epson X-Desk? Watch the response time as they draw the lines at the beginning. It seems quite slow, slower than Surface. I guess the finger traces is meant to be the equivalent of Surface's attract application. It wouldn't attract anyone unless someone else was already using the table. "Draw a circle to call up the menu." This is not discoverable, and doesn't even make sense since the menu is already on screen. Maybe there is a way to hide the menu but it isn't obvious. The menu only has room for four buttons. Do they plan to allow more than four apps in the application launcher? Once inside an application, there are two ugly bars in the center of the long sides with a "Back" button. That takes up more space than necessary and uses prime real estate that would be better used by the actual application. Phone comparison - Even copies the two phone comparison circle from the AT&T store application. When the lady moved the single phone around, the circle with text moved around in weird ways to stay out of the way. At first I thought this was a little bit neat but now that I think about it more, it's a bad idea since it doesn't consider how multiple users might be using the device at once. "Hey, I was reading that!" Drinks - Very basic app, displays some frankly unimpressive eye candy and the name of your drink when you put a tagged cup on the table. Would the form factor of this table even work well in a bar or night club? The IR tags have 16k possible values. This is between Microsoft's byte tag and high-res identity tag, and doesn't provide enough for many enterprise applications. The whole visual experience is very basic. It is obvious that they did not have a designer work on this or have any kind of UX expert. Perhaps what we saw was just a single demo and the menu isn't some kind of common application launcher. That's even worse, since it means Espon doesn't have any effort towards providing a uniform experience. The Surface team should not be afraid of X-Desk at all. It makes them look like an even better value with the better user experience. I saw this video of Dennis Wixon talking about what NUI is, the core principals, and what might come after NUI and I had to repost it here. Video via Jonathan Brill. Dennis Wixon | UX Week 2008 | Adaptive Path from Adaptive Path on Vimeo. I've seen this basic material presented several times by different people, notably Micrsoft's August De Los Reyes, who has a very exciting presentation style. Dennis in this video also did a very good job presenting the material in an engaging way as well as tying the material into his personal credentials and back story. When he started, he began doing the recent Microsoft presentation fad of introducing presentations by stating several off-topic useless facts about himself. I thought "oh no, here we go again" but was pleasantly surprised how he actually integrated the personal facts in with the main presentation content. "From that historical analysis we can extract a set principals and guidelines. The principals are what drives the design. The guidelines are simply derivations of the principals for an individual context. Principals are whats important. Principals and data drive successful design." This is an interesting way to introduce the principals. He leaves it unsaid, but basically the principals are timeless patterns independent of any technology. Guidelines are how you apply them to, e.g. Surface, iPhone, etc. Here is a cool video by Punchcut summarizing some considerations when designing touch interfaces. Video via Richard Monson-Haefel. Punchcut Perspective: Considerations for Designing Touch UI from Punchcut on Vimeo. The content itself makes sense, but I was more interested in the unique way the content was presented. The same content could have fit easily into a handful of PowerPoint bullets, but instead it is presented as if using a multitouch interface to control the content. You can see the shadows of hands in some parts and the auras of the fingers leave traces to make it clear what gestures are being used to manipulate the content. It is a little bit like the HP commercials where the famous person moves their hands around mid-air and photos or skateboard designs or documents move and animate as well. Of course the HP commercials are not meant to suggest that you could actually manipulate content like this with their current products. Well, maybe with the sixth sense device some of those gestures and visuals could be reality, but that's not what HP was thinking about. Unlike the HP commercials, the Punchcut video and the finger auras are actually close to a feasible design. It made me think what would have to change in order for that to be a real application. Let's deconstruct this NUI! Each of the sections in the video illustrated a different way to transition or manipulate content. This could be thought of similar to how PowerPoint allows different slide transitions or animations, but the manipulation mode is much more fundamental here and integrated with the content. Let's enumerate the sections, my name for them, and the gestures used within. (0:00) "Hello." - Flip card. Swipe to display text, then swipe to flip text around. Two-touch zoom out gesture to grow text. (0:05) "Five considerations" - Pivoting text. First finger establishes pivot point. Second finger swipes to control the pivoting transition from one content item to another. Finally swipe through text ("touch interfaces") to erase it. (0:12) "1" - Direct drawing. The finger draws any shape, in this case numbers, and the aura trail lingers about five times longer than in the other modes. (0:13) "Design for" - Pick a word. Swipe to fade in foreground text and background words. Tap each background word in order to add it to the foreground text. Kind of like typing except with entire words instead of letters. Note that the words are preformatted and punctuated. "immediate access" shows up in the title font size, while the rest of the words show up in the subtitle font size. Swipe completed text to push it off-screen. (0:24) "2" - Direct drawing. (0:26) "Tap is the new click" - Scatter text Swipe to drag text in from off-screen, then more swipes to push it around. Double tap to fade in additional text. Finally swipe the text off-screen. (0:32) "3" - Direct drawing. (0:35) "Clear mental models" - Rolodex Swipe up to rotate text in to view in 3-D. Previous and next text phrases are shown out of focus in the appropriate place in 3-D. Swipe up again to rotate the last phrase away. (0:41) "4" - Direct drawing. (0:43) "Design for hand sizes" - Zoom text & Keyboard Zoom in gesture to grow initial text from zero size. Touch and drag part of the phrase open to make room. Minimal keyboard appears, type to insert text. Press the larger button (enter?) to show additional lines of text. Note the keyboard doesn't display any labels to us, just outlines of buttons. Presumably the presenter either knows what the buttons do, or can see button labels on a different screen, or the specific buttons don't matter and will insert the correct text regardless. Finally, drag the text and keyboard off-screen with separate fingers. (0:53) "5" - Direct drawing. (0:56) "Touch feedback is key" - Tap feedback Drag text in from off-screen. Tap each line of text for a different highlight effect. Drag text off-screen. (1:03) "Touch is merely one dimension" - Directional transition by line Touch two fingers to establish an unseen line. A third finger swipes toward the line and text is animated on or off in a direction perpendicular to the line. (Sounds complicated but it makes sense when you see it.) One final swipe fades in some text. If replicating this presentation exactly, all the text and transitions would have to be prebuilt in an authoring mode. It would basically be glorified PowerPoint, and after the shininess factor wears off, it would not be that compelling. Some of the ideas below show how this application could be used in a much more dynamic and collaborative way. In addition, there are sometimes no visual cues to the presenter which gesture he or she needs to use to continue the presentation. Worse, the same gesture (swipe left) could do totally different things in different modes. In a presentation of any length with a variety of these transitions it would be very easy to forget the order and embarrass yourself by making gestures aimlessly trying to make content appear. Instead of having an authoring and presentation mode, merge the two and allow the presenter to choose the content and which manipulations to use during the presentation. This would require some type of manipulation menu and a content library. The content could still be authored in advance, but it could also be sucked up from external sources, for example a network drive or Flickr account. Allow the presenter to organize the content library however they want, but provide some tools to help. They might do it completely free form with piles of content, or might use a tool to draw lines between content or groups of content representing different relationships. The relationship could be specific to a presentation order or relate to the content itself. Let the user decide what works best for them. This by itself would be an enormous improvement over the enforced PowerPoint outline. Provide a resizing presentation area that overlays the rest of the interface. When the user is ready to present, he or she can drag content in and out of the presentation area as needed. Only the presentation area is shown on an external monitor or projector. If the presentation is really just a few people around one computer, the presentation area isn't necessary and the meeting should become more fluid and collaborative. Keep all the non-presented controls like the manipulation menu and unused content out of the presentation area. The presenter will be able to select from the manipulation menu or navigate the content library relationships off-screen, then bring items into the presentation area when ready. In this way the presenter can react to audience feedback and questions to bring up appropriate content, or a small group working together could just explore content and discuss it in a much more social way than linear PowerPoint presentations allow. I better stop here, otherwise I'll give away too many ideas for free! There is a lot of potential with NUI and touch interfaces for rethinking how we did things in the GUI world. The Punchcut video demonstrates this kind of NUI thinking perfectly.